Second Inversion hosts share a favorite selection from their weekly playlist. Tune in on Friday, May 11 to hear these pieces and plenty of other new and unusual music from all corners of the classical genre! Twenty years later, those words have come to encapsulate the astonishing legacy left behind by the late composer, who passed away in 2016. An artist, accordionist, and pioneer of experimental and electronic art music, Oliveros is remembered for her revolutionary tape experiments, her poetic and aleatoric musical scores, her groundbreaking musical philosophies, and above all, her unwavering devotion to the exploration of sound. When Stanley Kubrick’s 2001: A Space Odyssey hit theaters in 1968, it caused quite a stir. Here was a major Hollywood feature film that had no famous actors and very little dialog (indeed none at all during its first and last 25 minutes), a soundtrack built mainly from classical music matched to the imagery with extraordinary symbiosis, and an ambiguous ending that owed more to the aesthetics of experimental cinema than to conventional narrative filmmaking. Although the space age had inspired plenty of science fiction movies, Kubrick’s Odyssey was unique, and it remains so today even on the cusp of its 50th anniversary. In popular culture, the most iconic music from 2001 seems to be Strauss’s Also Sprach Zarathustra (the first 21 bars anyway), followed by the Blue Danube Waltz and the most degenerate rendition ever of Bicycle Built for Two. But connoisseurs of modern music are drawn to the evocative compositions of György Ligeti (1923–2006) that anchor the film’s monolith and stargate sequences. With digital projection technology making it easier for traditional concert venues to screen big Hollywood movies, orchestras have begun presenting Kubrick’s classic with live musicians instead of a canned soundtrack—and on June 30 and July 1, 2017, Seattle Symphony will do just that, joined by the Seattle Symphony Chorale, Associate Conductor Pablo Rus Broseta, and the vaunted technical crew at Benaroya Hall. Leading up to this will be three concerts June 22–24 featuring the first complete Seattle performances of one of the Ligeti works excerpted in the soundtrack, the Requiem. After 2001’s release, Ligeti fans quickly embraced it as a landmark for evangelizing his work (“You remember the music in 2001 when the astronaut goes through the stargate? That was Ligeti.”). But it turned out Kubrick had never even contacted Ligeti about the film—and when the composer first saw it, he was furious at the unauthorized use of his compositions. Lawyers eventually worked out the licensing, tempers cooled down, and Kubrick went on to use Ligeti’s music again (this time with the composer’s blessing) in The Shining and Eyes Wide Shut. Meanwhile, 2001 exposed Ligeti’s music to a wide audience, though for better or worse it was now associated with “space music.” But who was this Ligeti fellow anyway, and what was this strange music all about if it wasn’t written specifically for sci-fi flicks? Ligeti was born in Transylvania, a Hungarian-speaking border region that changed nationality twice during his youth (it’s now part of Romania). The family name is Hungarian, accented on the first syllable, and György is pronounced like “George.” A secular Jew of military age during World War II, he defied the odds by avoiding both conscription to the Eastern Front (where hundreds of thousands of Hungarian soldiers died) and deportation to the Nazi death camps (where most of his family perished). Ligeti came of age musically in the heavily-censored environment of post-War communist Hungary, where contact with contemporary classical music was suppressed, and even a national hero like Bartók was considered dangerously subversive. Most of Ligeti’s music from this time is folkloristic, but his best early composition, the First String Quartet (subtitled Métamorphoses Nocturnes), shows the clear influence of Bartókian modernism, even surreptitiously incorporating a four-note lick from the master’s “decadent” Fourth String Quartet as a recurring ritornello. In 1956 Soviet tanks brutally suppressed a popular uprising in Hungary, and Ligeti escaped to Vienna, eventually becoming an Austrian citizen. He took advantage of his new freedom to immerse himself in the post-War avant-garde, attending the famous Darmstadt Courses, and getting to know leading European composers like Boulez, Stockhausen, Xenakis, and Penderecki, as well as American figures like John Cage and David Tudor. After some experiments with tape music, Ligeti decided that when it came to creating new sounds, conventional instruments playing in unconventional ways could outclass the simple electronic music instruments available at the time. So he created a remarkable series of scores whose exploration of sheer instrumental timbre was unprecedented in Western music. Atmospheres (from 1961) is perhaps the purest expression of Ligeti’s new aesthetic, in which tone color is elevated to a role equal to or greater in importance than pitch and rhythm. Atmospheres has no recognizable tunes or distinctive rhythms, making it the ideal accompaniment for the entry of 2001 astronaut Dave Bowman into the stargate (a sequence that’s largely devoid of representational imagery). Stargate sequence from 2001: A Space Odyssey. Many listeners whose first exposure to Atmospheres is over the radio or through the soundtrack to 2001 assume that the piece is electronic—but it’s actually written for large orchestra. Ligeti discovered that sustained tone clusters—where all the available chromatic pitches within a specific range are sounded together—diminish one’s sense of definite pitch, leaving behind an impression of pure timbre and register. The piece starts off this way, pianissimo, with the full string section, joined by some horns and woodwinds, holding a chromatic cluster of notes distributed across four and a half octaves. At 4:21 in the above video, the double basses grind out a low cluster that ranges down to the orchestra’s bottommost C♯. Rather than coalescing into a chord, this cluster sounds more like a dark pool of color. It soon dissolves into a new sonority, made up of the remaining bowed strings individually sliding stepwise along a narrow range, a technique that Ligeti called micropolyphony. It looks incredibly complicated in the score excerpt—each player’s part is separately notated in 2/2 time with extreme rhythmic precision. But Ligeti’s notation is designed to synchronize the musicians and control the density of the texture without conveying any kind of beat. The effect is that of a slowly moving cloud, like a swarm of insects, with little sense of individually distinguishable line. Any composer can write a piece like this today, but it was Ligeti who demonstrated how these astonishing sounds could be coaxed out of an ensemble and organized into a new musical language that we now call sonorism. Poème Symphonique at Benaroya Hall, October 2012 with Ludovic Morlot in the background. There’s also no explicit libretto, though the singers do seem to be acting out some sort of unspecified comedic drama. Ligeti, like Cage, could deploy humor when he needed to, and that often gave him an edge over his more chronically serious European colleagues. A two-minute electronically filtered excerpt from Aventures accompanies Dave Bowman’s breathing as he walks through his extraterrestrial chambers in the final scene of 2001. Ligeti’s sense of humor also comes out in a few unabashed “joke” pieces, like the Poème Symphonique for 100 metronomes. Ligeti unveiled it in 1962 as a bit of Fluxus levity, but the gradually decaying clatter of the mechanical devices had its serious side which found expression later in several rhythmically driven “metronome” pieces, such as the third movement of the Second String Quartet, a landmark of the 20th century quartet repertory that applies sonorism to the intimate sphere of chamber music. Ligeti’s Requiem (completed in 1965) combines his sonorist and pointillist styles into a single epic work for large choir and orchestra and two solo female voices. It’s arguably one of the three greatest 20th century Requiem settings, along with Britten’s War Requiem and Stravinsky’s Requiem Canticles (all written in the 1960s by non-Catholics). The fact that it has taken half a century to mount a performance of it in Seattle is testament to its difficulty. The opening introit, Requiem æternam dona eis Domine, is in the style of Atmospheres. The dynamic range is from soft (p) to extraordinarily soft (pppp), and except for the line exaudi orationem meam (“hear my prayer”) growled by the basses midway through, the movement progresses gradually upward from bass to treble clusters—an obvious metaphor for ascension. At about five minutes in comes the last line, et lux perpetua luceat eis (“and may everlasting light shine upon them”), where Ligeti brings in a bright cluster featuring flutes and string harmonics. It’s like a gentle beam of white light illuminating the afterlife. The Kyrie appears in 2001’s monolith and stargate sequences. It’s a classic example of micropolyphony that took the composer nine months to write. Ligeti gives groups of choristers distinct entries where they start out in unison (supported by sustained orchestral notes), then fan out in disparate lines whose movement accelerates as their range expands—like a creek that divides into multiple channels as it descends a cascade (click here to see the score). Except for some initial consonants, you can’t really make out any words. Incredibly, the form is very similar to the great choral fugues of Handel and Haydn, but in place of the latter’s triumphalism the effect here is more like a subdued mob of humanity desperately pleading for mercy. Pieter Bruegel the Elder: The Last Judgment. After this ordeal, the closing Lacrimosa prayer functions as something of a release. It begins with a pedal on the orchestra’s lowest C♯, and progresses through a sound world similar to the introit, but it’s more transparent, with several textures featuring extreme lows and highs with little in the middle. The ending is ambiguous: a high cluster seems to offer illuminating hope, but the last word goes to the bass instruments, as if to reflect a fundamental ambivalence. Ligeti’s Requiem only sets a portion of the traditional text of the Catholic Mass for the Dead. In 1966, he wrote a separate setting of the closing Lux Aeterna communion for 16 a cappella voices. 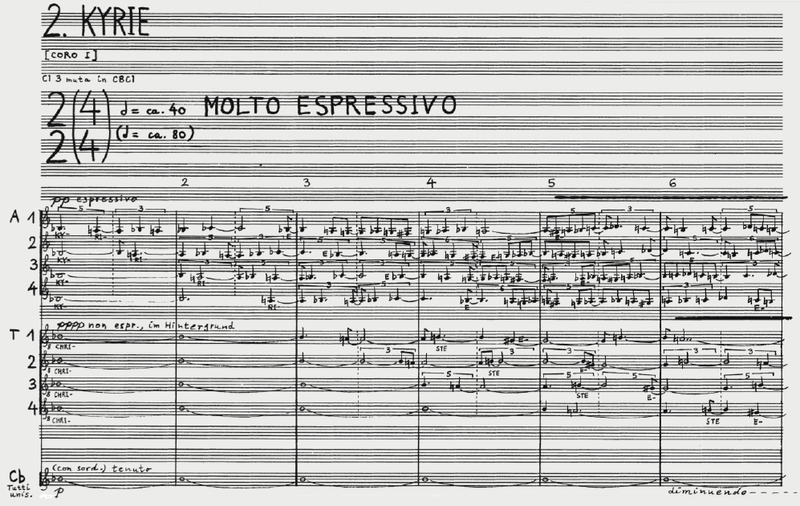 It’s the last Ligeti piece excerpted in 2001, where it accompanies the moon shuttle sequence, and it resembles the vocal writing in the Requiem’s Kyrie movement, though the lines move more slowly and the texture is more transparent. An interesting detail is that the first half of Lux emphasizes female voices while the latter half emphasizes men’s. Today the work is recognized as one of the classics of postmodern choral music. Ligeti’s sonorist period culminated in 1977 with Le Grand Macabre, his only full length opera. The success of its farcical, surrealist libretto, adapted from a play by Michel de Ghelderode, is still debated. But there’s little debate about the caliber of the music, which is colorful, varied, and unashamed of its voluptuous sound surface. After Le Grand Macabre Ligeti, like Beethoven, was quiet for a few years before reinventing himself in a third style period that combined avant-garde techniques with more traditional forms. What his middle period music did for timbre, his late music does for rhythm, and one often hears the distilled influence of African indigenous music, American minimalism, and the polymetric player piano studies of Conlon Nancarrow. Many of Ligeti’s most frequently performed works come from this period, including the Piano Etudes and the Violin Concerto which Augustin Hadelich will perform with Ludovic Morlot and the Seattle Symphony in January 2018. Ligeti’s last major work was the 2002 Hamburg Concerto for one solo horn, four “natural” (valveless) horns, and orchestra. He contemplated writing a second opera based on Alice in Wonderland, but old age and ill health curtailed his compositional activity. He died in 2006, leaving behind his wife Vera and his son Lukas, himself a noted composer and drummer based in the U.S. But this hardly scratches the surface of one of 20th century music most resourceful and multi-faceted characters: a cosmopolitan intellectual who taught composition in the local language at universities in Hungary, Germany, Sweden, and the U.S., and who could additionally speak French and Romanian; an atheist Jew who wrote one of the most important Requiems of all time; a gregarious and generous man who spent countless years haunted by the specter of death and evil; and an artist as demanding in his craft as he was daring in his aesthetics, notorious for insisting on precise execution of his meticulous performance directions. He had that in common with Kubrick, who was likewise infamous for his obsessive preparation and endless takes. By the end of their careers, both men were considered by many to be the best in the world at their profession. Perhaps their ultimate affinity was that of a lifetime devoted to perfecting new horizons. The Seattle Symphony performs Ligeti’s Requiem on June 22–24, 2017 and 2001: A Space Odyssey on June 30 and July 1, 2017. Click here for Second Inversion’s follow-up article, The Late Works of György Ligeti. Click here for a list of recommended recordings of Ligeti’s music.